The fiery, furious cascade of leaks and revelations coming out of US President Donald Trump’s White House in the first month of the new year has left us facing three possible conclusions, all equally unsettling: the president of the United States may well be a kook, a crook or an incompetent – perhaps some combination of the three. All prospects are worrisome, certainly for Americans, who are watching their 230-year-old governing institutions stretched to the breaking point. But it is also frightening for the world, living with the possibility the most powerful nation on the planet may be led by someone who could be mentally unhinged, ethically unfit or demonstrably unqualified for the job. For Asian countries located within the potential blast radius, nuclear annihilation is no joking matter. But Asia’s experience dealing with their own incompetent leaders may offer a way out. Trump’s mental fitness – and the possibility he might be unstable – has become the hottest topic in Washington and beyond, fuelled by Trump himself who declared, via his favoured medium, that he is “a very stable genius”. When the president of the United States has to defend himself against accusations of being mentally unstable by declaring himself “like, really smart”, then Houston, we have a problem. Trump was of course responding to the allegations in a new tell-all book Fire and Fury by media critic Michael Wolff, which paints a picture of Trump as a narcissistic, unfocused, barely literate man-child with a short attention span who various aides have learnt to manage around. What was most interesting about Wolff’s book is how it was so unsurprising, its details and on-the-record remarks essentially confirming so much of what was already known or suspected. Trump’s mental state has been the subject of open discussion for months, even among his erstwhile allies. Now the question over whether the president is mentally sound, once whispered and hinted, has gone mainstream. When the president of the United States threatens to punish North Korea with “fire and fury”, it might easily be dismissed as a modern-day version of Richard Nixon’s “madman theory”: if you make opponents think you are irrational, they will avoid any provocation. But when the one firing off tweets threatening nuclear Armageddon is also known to espouse nutty conspiracy theories – widespread election fraud cost him the popular vote, former president Barack Obama wiretapped his phones – this may not be part of some grand strategic plan. It might instead be time to buy gold, stock up on baked beans and head for the shelters. However, it’s January’s other major revelation – the crazy man in the White House may actually be a crook – that could save the planet from nuclear annihilation. 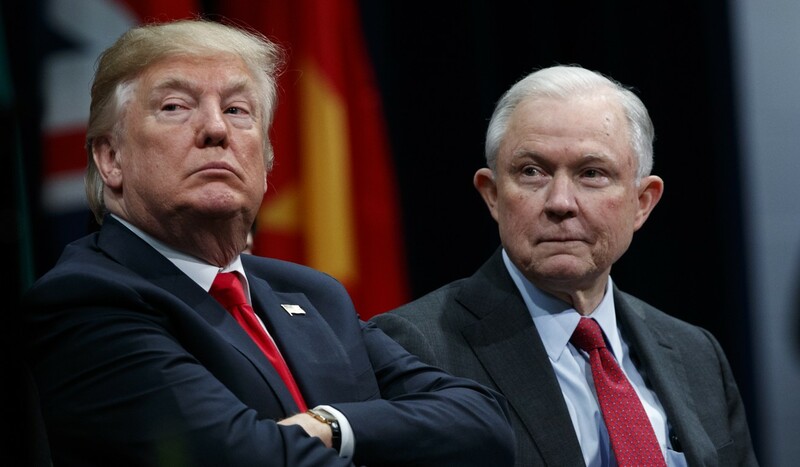 The New York Times reported Trump instructed White House aides to pressure Attorney General Jeff Sessions not to recuse himself from the federal investigation into Russian meddling in the 2016 election. Trump wanted to shield himself from any probing of whether Vladimir Putin aided his unlikely victory and he needed a known loyalist like Sessions in charge of the Justice Department. Under the American system, there is no easy way to remove a president who is a kook or an incompetent. There is talk of invoking a never used constitutional remedy, the 25th Amendment, which allows for the removal of a president deemed incapable of carrying out his duties. But that amendment, passed in the wake of the Kennedy assassination, was designed to be used if a president were incapacitated in an assassination attempt – alive but brain-dead, for example. Invoking it involves major obstacles, requiring the consent of the vice-president and majority of the Cabinet. And the president is allowed to fight back. But the path to removing a crook is much clearer: impeachment. It’s been used before in Asia, where the Philippines and Indonesia come to mind. In Indonesia, Abdurrahman Wahid, affectionately known as “Gus Dur”, became president in 1999 after the fall of Suharto. Wahid, legally blind and debilitated by strokes, was a worldly scholar and a wily political operator, but he was an abysmal administrator and a bumbling, amateurish president. He was eventually removed by the parliament not for his ineptness but for corruption, including an unaccounted for US$2 million “gift” from the Sultan of Brunei, and a second scandal where his personal masseur withdrew US$4 million from a state agency’s cash reserves. The more apt parallel to Trump may be the former Philippine president (and now Manila mayor) Joseph “Erap” Estrada, a one-time action movie star who swaggered his way into the presidential palace based mostly on his name recognition and celebrity from films like You’re Only Worth One Bullet. Estrada, a renowned womaniser, was widely deemed disengaged and out of his depth as president, more interested in late-night drinking, gambling and carousing with his dubious pals. He was also known for his tortured use of the English language. Like Wahid, Estrada was brought down not for incompetence but corruption – he was implicated in an illegal lottery scandal by one of his former drinking buddies. So to resolve the current problem in the White House, all eyes are now on Robert Mueller, the special counsel leading the probe of Russia’s attempts to tilt the election to Trump. It has been reported Mueller’s team of investigators is now looking at whether Trump was involved in obstruction of justice for trying to block the probe, while also digging into the Trump firm’s business dealings. It remains a long shot. Trump is unlikely to resign or be forced out for incompetence or mental instability. But the investigators may yet find evidence Trump tried to tamper with a federal probe, proving once again the adage that the cover-up is always worse than the crime. But now we can only wait. And pray for Mueller to bring us deliverance.